How long do the health benefits of cut lemons last? I have read that once cutting open a lemon and it is exposed to the air and poured into a drink, you only have 30 minutes to drink it or else the helpful effects of the lemon juice no longer work. Same to be said for the other half of the sliced lemon, after 30 minutes of being sliced, that remaining half of the lemon is no good anymore for all of the beneficial effects. True or False?? Great question! I was not positive of the answer myself and thus I have done much research to try to find out. Unfortunately, I still do not have a definitive answer. I think it would take a food scientist to actually analyze the lemon after it is cut to determine how long the nutrients, enzymes, and molecular structure of the lemon will continue to provide health benefits. So, until I find a food scientist who has done this research or is willing to do it, I will share what I know and have personally experienced from drinking lemon juice for several years. As you may know, lemons have a powerful anti-oxidizing effect. This is evident in the common knowledge that squeezing lemon juice on fruit salads, for example, or any cut fruit or vegetable will slow the oxidizing process and prevent the food from turning brown as fast. So the lemon itself has a slow oxidation rate, even after being cut open, which means that it will stay fresh longer than most other cut fruit if properly stored. As I have mentioned on this site, one of the unique properties of lemon juice is that it is similar in atomic structure to hydrochloric acid, bile, saliva, and the stomach’s digestive juices. In fact, lemons are one of the only foods that have more negatively charged ions of energy as compared to positively charged ions in their atomic structure. In essence, this negative electrical charge is a rare food property. This is a KEY as to why lemons work so well and are so beneficial! I don’t have any way of testing how long this atomic structure remains intact once the lemon is juiced or cut open. However, from my personal experience of drinking lemon water for many years, I believe it is much longer than 30 minutes. In fact, I would guess 12 to 24 hours if the cut lemon is stored properly. As far as the beneficial nutrients in lemons, such as citric acid, vitamin C, potassium, calcium, phosphorous and magnesium, these should be mostly preserved in the properly stored cut lemon for 2 to 4 days. Lemons are also rich in enzymes, which will start to diminish once the lemon is cut and exposed to air. So, proper storage in an air tight container will make a difference. There are a number of ways to store a cut lemon in the refrigerator. My favorite container is a tightly sealed glass jar. A Lemon / Lime Saver is also a good choice and can be bought online or in some retail stores. A sealed plastic bag will also work but I don’t like the idea of the chemicals from the plastic possibly leeching into the lemon because of its acidity. The main point is that food will oxidize when exposed to heat, light and air. Thus, keeping it refrigerated in an air-tight container will preserve the essential properties of the lemon longer. Bottom line is this: There is no question that you will get the most benefits from drinking fresh-squeezed lemon juice. If you live in a household with at least one other person, why not each of you squeeze half a lemon in 16 ounces of water first thing in the morning and drink it right away to get the optimal benefits? If you are on your own, then use half the lemon in the morning and half the lemon at night. I believe you will still get most of the lemon benefits. If you only drink lemon juice once a day, you could use the other half of the lemon the next day, and still experience some benefits. I believe anything past the 24 hours of cutting the lemon will bring diminishing returns—but will get some nutritional benefits as long as the lemon is not spoiled. Remember that even though the outer part of the cut lemon is exposed to air, the inner part is still contained and will hold some of its beneficial properties. 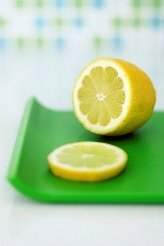 Also remember to wash the lemon with filtered water and preferably a vegetable brush before cutting it open to prevent contamination from bacteria, parasites, or other organic or inorganic toxins that might be on the lemon skin.